If you are struggling to find new exciting workouts, or are looking to step up your level of intensity without the weight bearing effects of jumping then these Row Machine Workouts are just what you need. I am a big fan of Row Machines because of their ability to work the muscular system (upper and lower body muscles in a push and pull movement pattern) and also work the cardiovascular system. Done correctly, your legs will do a lot of "pushing" and your upper arms/back will do lots of "pulling". Depending on the machine that you use, the level of difficulty can be changed by simply moving a lever up or down to increase the resistance (either a belt or water). The most commonly used row machines are the Concept 2. If you have never been on a row machine you may not want to jump right into these workouts. Instead spend a few weeks getting your muscles accustomed to the movement and keep the intensity relatively low and steady. Most machines will display your distance, time, watts (amount of power output), and SPM (strokes per minute). Here are a few workouts you can add to your current workout program to take your fitness to a new level. Just keep in mind that these are not going to be easy, so make sure you are hydrated and, if possible, aim a fan at you to help keep your body temperature down. Each week I will post a new row machine workout, but today I am going to give you three you can use. Each full workout should take between 15-30 min. 1. 3 x 750m x3min - After warming up, row at a moderately hard pace for 750m and then row easy for 3 min. Continue this pattern 2 more times for a total of 3 sets. 2. 10 x 250m x 2min - After warming up, row hard for 250m followed by 2 min of easy rowing. Same format as above by try to increase the intensity for the 250m efforts. Keep an eye on your watts and try to maintain the same for all 10 sets. 3. 8 x 1min x 1min - After warming up, do 8 sets of 1 min hard and 1 min easy. 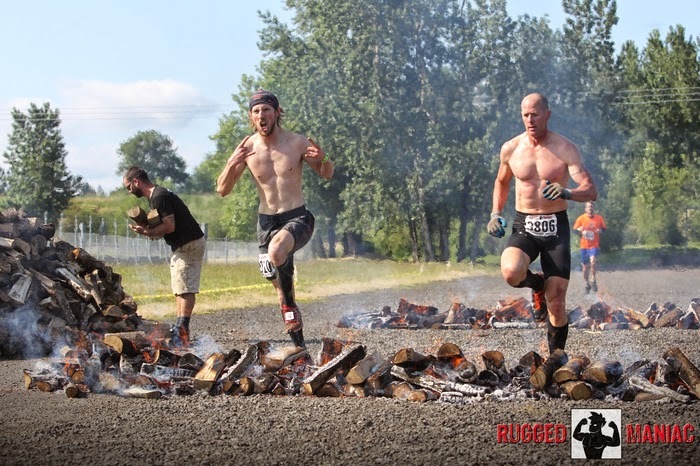 This past weekend I competed in the Renegade Rage Obstacle Course Race (OCR) in Kennewick, WA. In my efforts to prepare for the OCR World Championships in October this looked like the perfect course to attend before the priority races in July and August. Coming in with good fitness, there were some obstacles I still needed to work on and this race had some of those. On a hot,sunny day (85 degrees+) and overlooking the scenic Columbia River, I covered the course in 1 hour 3 minutes to win the Elite category. Way harder race than I was anticipating. Right from the start the race went uphill, actually a lot uphill. Not sure of the total elevation gain, but if I had to guess I would say about 1200 ft gain in under a mile. And along the way were a semi-truck trailer to navigate through before jumping out into a 6-foot deep water pit, and at the top of the hill was the rope climb. Nothing like trying to catch your breathe while having to climb 20 ft of rope (and still trying to soak in the amazing views of the river). I found myself running with 1 other person from the rope climb to the finish. I assumed he was in the Elite category but later realized he wasn't, but it sure was nice to have another person out there to help navigate the course. At times it became very difficult to determine which way to go as there was a little shortage of direction arrows. The Elite course meandered 7 miles up, over, down and around 5500 acres of farm land with 23 challenging obstacles mixed in about every 1/4 mile. The rest of the competitors raced on a shorter version, the 3 miler. 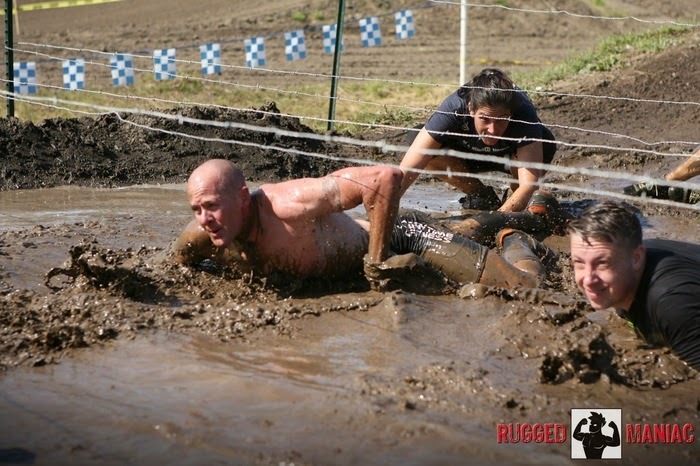 I even convinced my brother-in-law, Peter, to do his first obstacle course race. I gave him some training workouts to help prepare and he killed it. He finished all 3-miles and all obstacles (except the rope climb) and this was not an easy "first-timer" course. Although the race is in it's first year, it definitely did not disappoint. The entire crew worked hard to put on one of the better races in the Northwest. Sure there were a few things that could have run more smoothly (more course markings, and maybe an awards ceremony a little earlier with podiums), but all of the positives easily outweigh the negatives. This race should be on your race calendar for next year; in my opinion it ranks right up there with a Tough Mudder and Spartan Race. 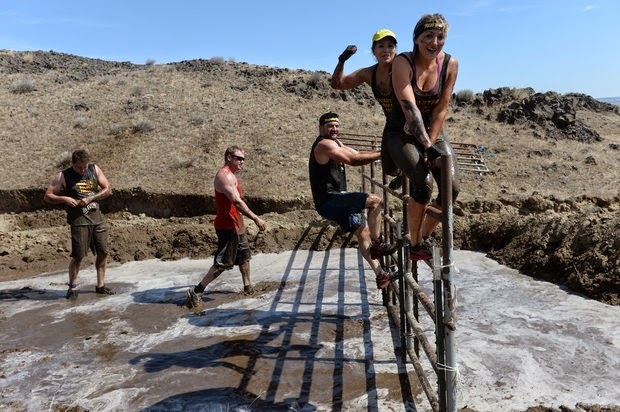 For those who did the Tough Mudder Oregon last year in Fossil, this course was almost identical as far as terrain (maybe even more challenging) but the obstacles in the Renegade Rage race were far better and more challenging. 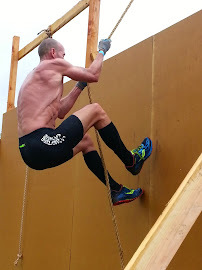 Besides the rope climb and trailer jump, some of the obstacles included a 100 yard tire drag, 50 yard tire flip, 40lb potato sac carry for 50 yards, several logs to walk across, a couple tunnels to run through, a very long barbed wire/ice crawl, monkey bars, wall traverse, 3 tall wall climbs (only 1 with a foot hold) a couple barrels to go under and over in water, a tire run, and when your legs are already screaming they finish things off with the wall of death (similar to Tough Mudder's); a 15-foot half pipe. The guys helping out at the top to grab people's arms got in a good arm workout I'm sure. All of the volunteers were very helpful at each obstacle and I believe most of them were from Jubilee Leadership Academy. However, running for a 1/4 mile, stopping and doing several exercises (or an obstacle) can make those 3 or 6 miles seem much more challenging. This is what I have been working on the last few weeks is the non-steady (start and stop) running. 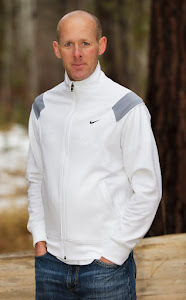 As a former ultra-endurance mountain bike racer, I have been accustomed to getting into my "tempo" during an event and trying to maintain that for 6-24 hours. I became very good at controlling my HR and stabilizing my energy levels. Nutrition was a huge factor in that, but I also trained my body and muscles to push a certain pace for hours on end (without going over my threshold). The break in rhythm of running takes a toll not only on the cardiovascular system but also the muscular system. Besides, most of the running is not at a "tempo" or controlled pace. Because of the short distances between obstacles I am running at or near my threshold. Then when navigating an obstacle I try to conserve energy and not expend too much. Sometimes this can be very difficult and then as a result the running will slow down to try and recover. Repeated wall climbs - four to six 8 foot walls spaced 10 feet apart from each other. 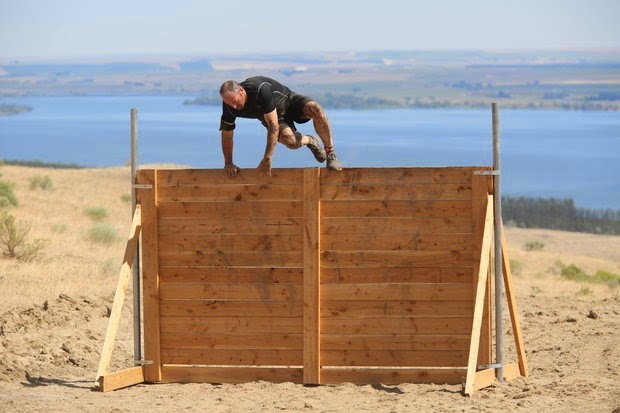 This really takes a lot of energy to get your body up and over the walls and when you go to run to the next obstacle it can take a while to get back up to race speed. 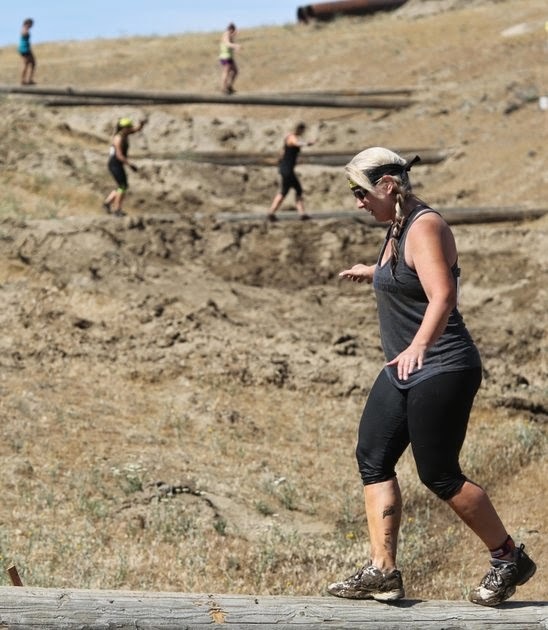 Short mounds of mud/dirt - this may not seem challenging to those watching, but having to run up short mounds of man-made hills (10 feet tall) breaks the running rhythm and can use lots of energy doing so, especially if the mud/dirt is wet and slippery. Lots of stabilizing muscles will be called on to help get you over them and can zap the needed energy to sprint to the net obstacle. Over/Under Hurdles - If there are several of these in a row, these can completely slow down your running. Most races will have a section of logs that you have to hop over and crouch under for several yards. Doing this effectively will use lots of core strength and requires lots of jumping, which will always tire the legs. The list could go on, but these are just a few of the one's I have experienced recently that have altered my running in between each obstacle. When having to navigate an obstacle, you want to go as fast as you can, but you also have to take your time as in some races it could cost you many burpees if you don't complete the obstacle (fall off the balance beam, hopping from one log stump to another, etc). And, going to fast when your shoes are wet over an A-Frame wall could cause you to fall and result in a pretty serious injury. 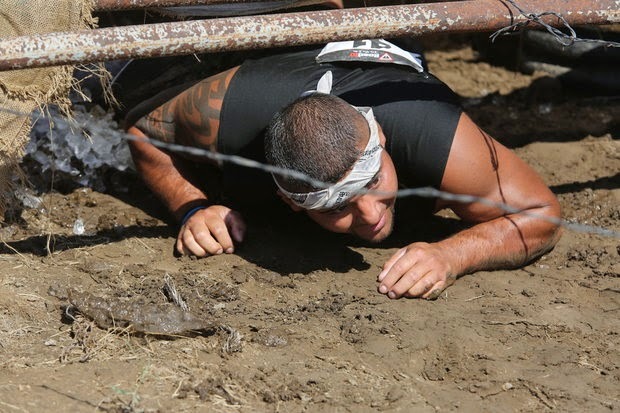 Obstacle course races are a great way to help develop mental toughness, how to overcome fears, how to accomplish something you may not have thought you could, and to get a good workout in. It can be a great way for a team or company to help teammates/employees work together and build a better bond between each other. The event was held at the Portland International Raceway, just 10 minutes from downtown Portland, OR. 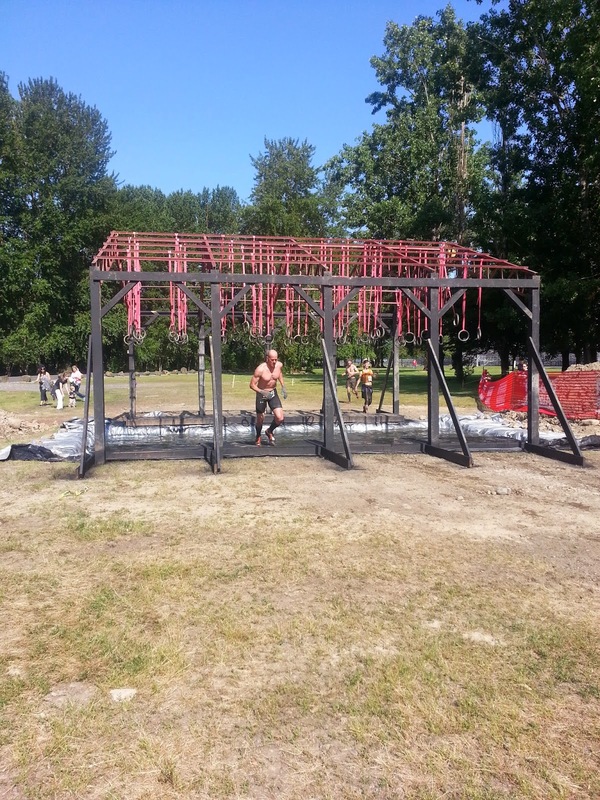 With amazing scenery and a raceway that had me itching to come back to watch a car race, I was ready to compete in my 3rd obstacle race this year. 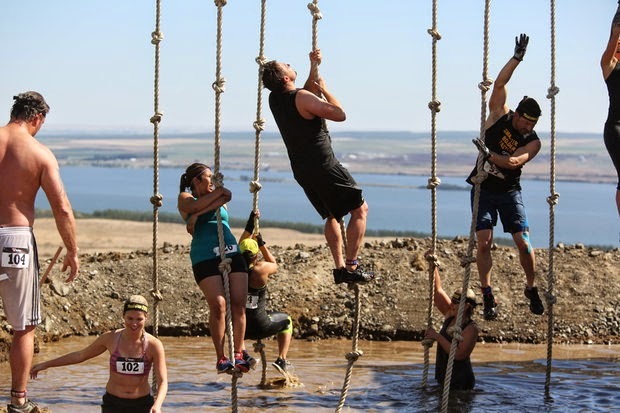 The Rugged Maniac events are one of the more popular race organizers (behind only Spartan Race, Tough Mudder, and Warrior Dash). The weather couldn't have been any better; sunny skies, 70 degree temps and no wind. By the looks of things at the start, I would guess there were about 2,000 participants all together. In the competitive category there were a total of 175 (broken into 2 separate heat waves). 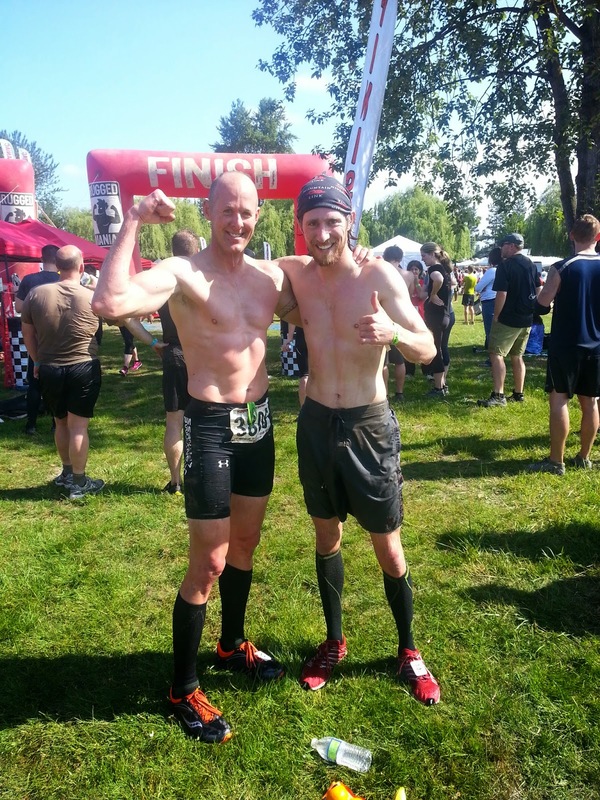 One of my clients/friends from Anytime Fitness - Bend, Dave Forbes, also came along to compete in his first obstacle race. He is a strong runner and I have been training him to prepare for this event. I think he has a slight addiction to these already. My strategy was to start fast but still conserve some energy in the beginning. The first 3/4 miles were all running (through a grassy area and 2 muddy ditches filled with water). Dave and I were quickly in the lead and by the first obstacle - 2 big walls to climb - had a comfortable lead. More running for the next 3/4 miles on gravel road led us to a 30' water crossing (named their "surprise obstacle"). At first it was shallow, but by the last 5 feet it dropped significantly and I found myself completely submerged underwater. I knew something like this was coming, just didn't know when. I guess I got "surprised". Dave and I in the lead heading to the "surprise obstacle"
Another racer had slowly started to catch up to us and after more running, jumping over 3 foot-wide ditches, and a couple dirt mounds to run up we were all together. Then we arrived at the balance beam crossing. There were 5 beams (each 4 feet apart from each other) that were 20 feet long above water. The beams were only about 6" wide. I started across the beam and began to lose my balance and a foot came off. However, I quickly regained my balance and continued forward not long before losing my balance again, and again saving myself from falling into the water. I finally made it across to the other side but now had to chase to catch up to the leader. Dave got a little stuck behind a woman on the balance beam but he too shortly caught back up. The three of us stayed together most of the race changing leads periodically through different obstacles. I noticed that on the tall wall climbs that both Dave and I lost a little time to the other guy, but on the running and water obstacles that we both gained a little time. Dave started to fade back a little as we neared the finish. With only about 1/2 mile to go to the finish there were six 6-foot walls to go over, a ring crossing over water, a cargo net to climb and a 50' water slide to go down. I lost a little time through the 6' walls even though I felt like I was going fast through them. In the end, I finished with a time of 29:43 and was 2nd in my heat wave. Dave finished in 3rd with a time of 30:14. Overall I finished 7th out of the 175 competitive racers and Dave finished 9th.